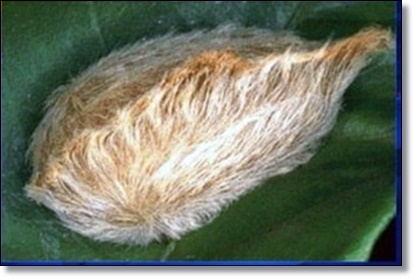 Tampa, Florida - It's a fat, furry caterpillar that is popping up in trees across Florida, and it's known as the "puss caterpillar," or Megalopyge opercularis. Its fur is actually covered in venom. Doctors from the University of Florida say the second you touch this caterpillar you feel instant, intense pain, which Holly Nokes can attest to. 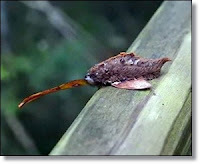 "Had one land on my camera strap last year," Nokes told FOX 13. "Burning-stinging-on-fire pain within a second of coming in contact with it. No itching just nonstop, excruciating pain. Six hours after, experienced chest pain, too," said Nokes, which led her to the emergency room. 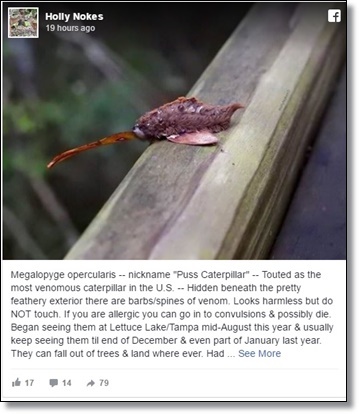 Nokes shared a photo with FOX 13 that was taken on September 14 of the caterpillar at Lettuce Lake Park. Doctors say the pain is worse than a bee, jellyfish, or scorpion, and it can also cause vomiting and convulsions. They say be aware of them while working outdoors because they are known to fall out of trees, which Nokes says is what happened to her.